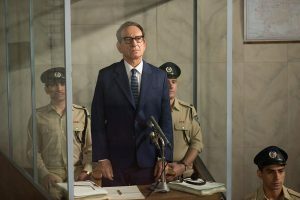 ‘Operation Finale’ tells the gripping story of Nazi Adolf Eichmann’s long-awaited capture in Buenos Aries in 1960. Although this true tale is fictionalized and dramatized in order to make the emotions of both Eichmann and his capturers the focal point, director Chris Weitz does a good job of telling this important story. The core of this film pivots around a team of agent’s efforts to capture Eichmann and bring him to trial in Israel. This means they must travel to Argentina, where he’s been hiding under the pseudonym of Richard Klement, and bring him back. When issues with the team’s plan arise, they must appeal to Eichmann’s emotional and somewhat egotistical side. The film’s protagonist, Peter Malkin, builds an unexpected relationship with the former Nazi leader. This results in a tango of words between our protagonist and antagonist. Eichmann, often called ‘the architect of the Holocaust,’ states multiple times while talking to Malkin that he was only following orders and merely a cog in the Final Solution machine. Despite the truth written in our history books, that Eichmann was a willing accomplice to genocide, Sir Ben Kingsley does a fascinating job of pleading an emotional case through his character. The viewer witnesses the fictional Eichmann in his most vulnerable state, somehow forcing them to feel a tiny bit sorry for him even against all odds. This film does a compelling job of showing the inner battle Malkin faces between his anger and hatred toward Eichmann and his knowledge of how paramount Eichmann’s trial would be. ‘Operation Finale’ isn’t just another historical drama. The film delivers a peace about the past in a haunting and chilling way.